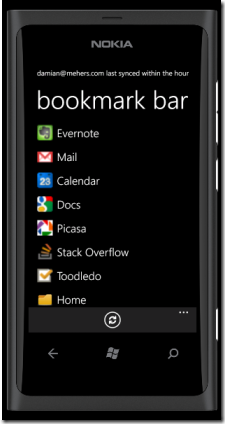 Chrync syncs your Chrome bookmarks, recently viewed pages and open tabs down to your Windows Phone. Click here for a short video of it in action. You don’t have to install any special Chrome add-in for it to work, and the only servers Chrync talks to are Google’s own servers, to authenticate and then to sync. The way I’ve implemented Chrync is that it talks to Google’s servers using the native Chrome sync protocol, exactly like Chrome itself does. I’m charging US$0.99, but there is an unlimited trial – I’m fine for people to use it on a trial basis for as long as they want … The app is available from the marketplace here. Give it a go and let me know what you think at this User Voice site. This entry was posted in WP7 on March 24, 2012 by damian.